*Park Picture Credits ‘Vishakh Rathi’. Park started on 14th July 2017 and within a week residents around Perry Road and Pali Hill are opposing the commercial move inside the silent residential zone. Approximate area of 5000 square feet which is used by this food truck park which can accommodate about 10 to 13 medium sides trucks. Food Trucks will be opened 7 days week from 12:00 Pm to 10:00 Pm. On the menu will be Punjabi Dishes, Special Gujarati Food, Hummus, Lebanese Food, Famous and in Demand Falafel, United States famous Hot-Dogs, varieties of drinks. Veg or Non-Veg : Both. Will Alcohol be served : No, Alcohol not served or allowed. Park Address : Anthony’s Garage, St Paul Road Extension, Behind Candies Lane, Pali Hill, Bandra West, Mumbai 400050. Menu and Prices : As listed below individually, May change from time to time. Cuisines & Dishes : Fast Food and American. On Menu : New York Style Hot Dogs (Rs.120, Chicken Steak Burgur (Rs.130), Chicken Tikka Burger (Rs.130), Smoked Chicken Tarts (Rs.50), Chicken Tikka Roll (Rs. 100), Chilly Cheese Chori’s Pav (Rs.100) and more..
Money transaction : Cash only. Cuisines & Dishes : Desserts. On Menu : Adventure of Nutella (Rs.150), Old School Oreo (Rs.140), Coffee Toffee (Rs.130), Wacky Walnut (Rs.150) and much more.. Serving options : Home Delivery and Outdoor Seating. Contacts : +91-9920783795 & +91-9773896060. Cuisines & Dishes : Italian. On Menu : Pasta Power (Rs.100), Fiery Jalapeño (Rs.100), BBQ Chicken Sausage (Rs.150), Chicken Kheema (Rs.150), Bacon Bang Bang (Rs.150), Super Sorpotel (Rs.130) and Chocolate (Rs.130). Cuisines & Dishes : Healthy Food. Contacts : +91-9004827444 & +91-9833122825. Cuisines : Mexican, Rolls, North Indian, Continental, Burger and Fast Food. On Menu : Macin It (Rs.180), The Mutton Megalodon (Rs.250), The Big Persian (Rs.220), Classic Veg Burger (Rs.120), Classic Chicken Burger (Rs.130) and Classic Mutton Burger (Rs.150). Money transaction : Cash, Cards and Wallets. Cuisines : North Indian, Fast Food and Mexican. 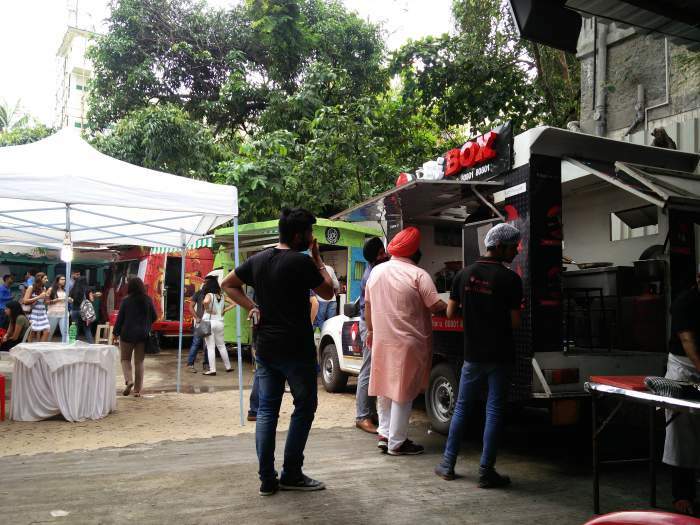 and more of such food trucks..
You might also like to know more about Mumbai eateries.